In my previous article, From Producer to Leader, I listed eight of the nine things you would need to do, to develop your leadership mindset. Now the big reveal – the ninth thing you must do to continue climbing the leadership ladder: replace yourself. To replace yourself, you should start by looking at all the people who work for you. See if you can find someone on your team who has exhibited potential. You might even look for people that work in other departments, or you might look outside the organization. But initially, start by looking within your team. RN – Ready now. Can be promoted today. R1 – Ready in 1 year. Will be ready to promote in a year. R2 – Ready in 2 years. Will be ready to promote in 2, or more, years. Once you’ve identified your potential leaders and their readiness to be promoted, it’s time to put together an individually tailored growth plan to provide the opportunity for each of them to reach their leadership potential. You’ll learn a lot by how they follow through on their plan. You’re bound to experience some surprises. Okay, some of you might be asking, what if I identify my replacement and start training them, won’t I be asked to leave because there is someone who can replace me? That’s a normal question that any rational person would ask. However, the answer might seem a little counter-intuitive. First, we’re talking about this from the one-in-ten perspective. You were promoted to your current level and the assumption is, you want to keep growing, you want to be given more responsibility and you want to go to the next level. You significantly increase your chances of being passed over if there is not a replacement ready to take your spot. This is most likely to happen if you have key clients, you’re responsible for a significant portion of the business or what you do is vital or critical to the functioning of the business. Nobody wants a hiccup. And nobody wants to risk putting someone in your position that’s going to crash and burn. If you have a replacement ready, or two or three to choose from, then you can be ready to move immediately into the next opportunity. If you wait until an opportunity presents itself, it’s too late to get ready. In other words, you have to be prepared so that when the opportunity does present itself, you can respond immediately. Second, even if you don’t want to go beyond your current level, if you aren’t actively raising up and developing leaders and talent that can grow into other leadership positions and keep the business vibrant and healthy, you risk being identified as a blocker. Everyone wants a leader who develops others. Nobody wants a leader who blocks others and limits their potential. Another thing some of you might be asking, do I let my replacement know that’s what I’m preparing them for? You need to manage expectations (it’s one of the other eight things), right? Personally, I would never promise someone a position because I may not be able to deliver. Particularly in a large organization, there should be many RN, R1, and R2 leaders in the development. So, someone else might be ready sooner or be more qualified to fill a particular role who’s better than the person you are working with and developing. I think you should let your high performers and high potential team members know that you know they are on a development track. They already know they are outperforming the rest of the group, they want to know that you know it too. Fail here, and they may feel undervalued and unappreciated and start looking for other opportunities. We just talked about the outward look: looking at your team, evaluating them. There is the all-important inward look. Am I confident enough? It’s a security/insecurity question. The insecure leader is never going to raise up their replacement because they’re afraid. “I’m going to raise somebody up, they’re going to be better than me, or they’re going to figure out they can save a lot of money by getting rid of me and putting this other person in my spot. And so, that’s too high risk, I’m not going to develop people.” There are a whole lot of managers in that situation. They never develop people. They’re really protecting their “turf”, their job. They say they’re protecting their job and income. But in reality, they’re harming it, because they’re eliminating the possibility of growth, both financially and professionally, for themselves and others. The secure leader is not only going to identify a replacement, they’re going to find someone who will do their job better than they do. Here’s what the secure leader knows: If you’re climbing a hill, you don’t know what’s over the crest of the hill until you get to the top of the hill, to look beyond it. Once on top, you can see the hills and mountain peaks on the other side. And then you climb the next hill, and you can see further. And then you get to the next one, a little bit higher, and you can see further. It’s the same thing with any kind of performance improvement. 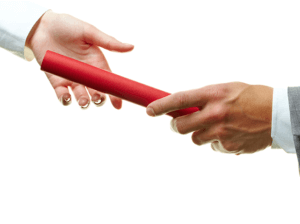 The secure leader knows that when they hand off the baton, the next “runner” is starting from that point, the point where they brought the team, not from the beginning. So, by definition, if you picked well, they will take the team further than you did. It doesn’t make you look bad, it makes you look like a genius. There will always be those people who look at a new leader that comes in after the previous one leaves and the company/organization/etc. doubles in size, and they gushing over the new leader: “This leader’s amazing! The last leader only grew it by 50%, but this gal grew it by 100%. She’s amazing!” Well, maybe, maybe not. You can’t compare the two, because the new person’s not starting where the previous person started. The situation is different, the circumstances are different and the baseline is different. The person before her brought it to a mountain peak, and only because they did that, can she be in a position to take it to the next mountain peak. But if she had started where the other person started, a true apples to apples comparison, you don’t know how she would do. So, unless the previous leader was a dismal failure, broke the law, or did something incredibly stupid, recognize them for getting the team where they did so the next leader could run full speed ahead. Rest in the security of knowing that if you’re being promoted, or being asked to take on more responsibility, you’re running the race well. And when you pass that baton, rest in the knowledge that you brought it to where it was. Your finish line at that job is someone else’s starting line. Just like your starting line is the last person’s finish line. And that’s how it’s supposed to be. Next time, we’ll take a look at why evaluating your team based on performance and behavior is critical.